Before we started our crusades for peaceful integration and the desegregation of schools, we supported protests against the Vietnam War. My personal incentive was because Uncle Paul was drafted and sent to Vietnam. As a “conscientious objector” he objected to the killing and war, but was forced by law to serve, which he did faithfully as a clerk (our own “Radar O’Reilly”). We used to talk to him via cassette tapes, drawing and sending pictures through the mail (all the kids) and via Aunt Pat, whom he married when he came home on leave. Another thing that troubled us about the Vietnam War was the treatment by American people toward soldiers in uniform here in the U.S. Uncle Paul was spit on by protestors at the airport, and called “baby killer” by war protestors who thought that protesting the soldier would make any difference to the wheels of war! We did not agree with the war but we did not blame the soldiers. We KNEW it was not the soldiers’ fault because Uncle Paul was a soldier and he didn’t want to be there!. Peaceful war demonstrations became deadly. 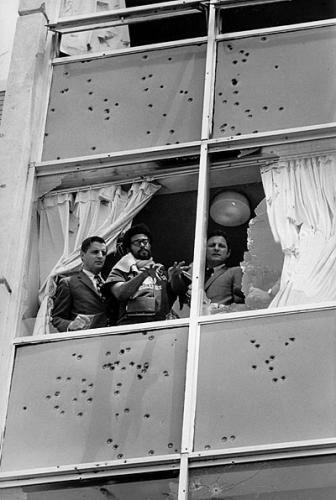 We were, like everyone else, traumatized by the shooting of college students at Kent State and the lesser-known shootings at Jackson State.Grandma Sabatini wanted to shield the children from the gruesome photographs and the violent news on television. My mom said she wanted us to know what was going on. Compromise, we could be talked to about what was going on but we didn’t need to keep watching the violence or staring at its picture. 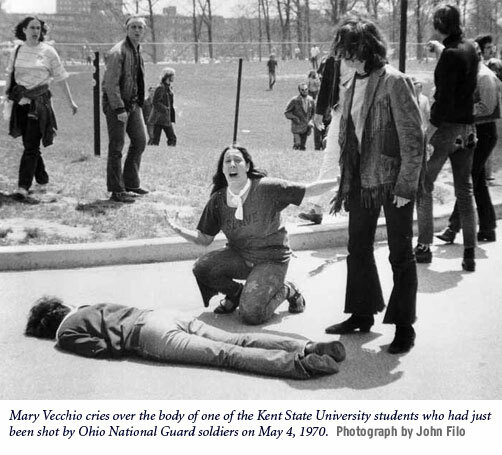 “Us kids” had smuggled a Time magazine with Kent State shootings on its cover into a corner of the living room to peer into and we got busted. It was taken away and we were sent outside to play. I circulated my first petition in kindergarten, when I brought a petition to school (from my mom) to try to get teacher signatures to help protest S.T.R.E.S.S. in Detroit. 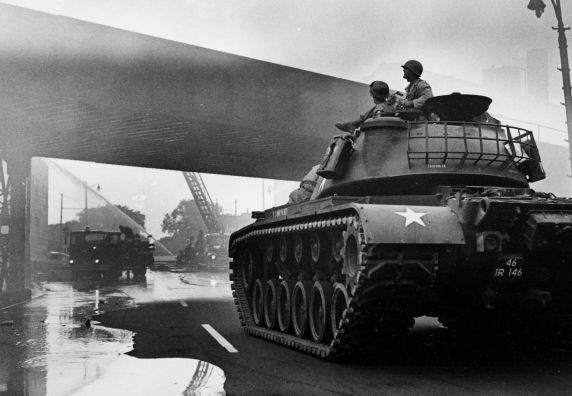 There was one day, during the riots, when the Governor deployed tanks into the neighborhoods via the National Guard. We watched tanks rolling down our streets, were advised not to leave the house during the imposed curfew hours, by armed soldiers using bull horns. 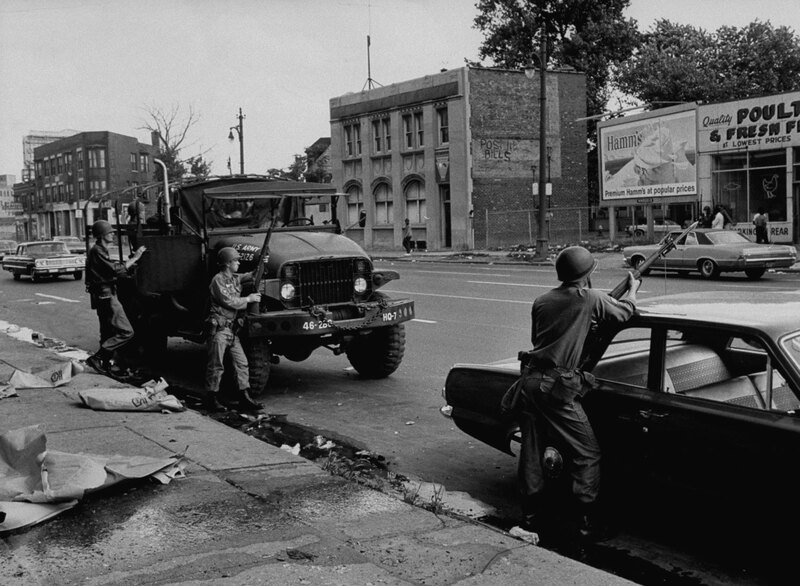 In Detroit, We were under martial law. 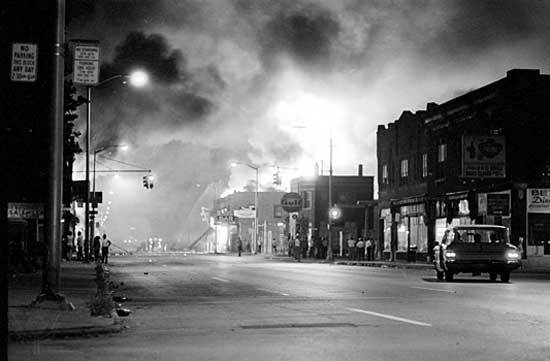 My father, a navy man, was proud to see the show of strength to quell the riots (like many other people who were concerned about the violence between Blacks and Whites, police and citizens, who were watching the burnings in the city by television). He stood on the porch saluting until my mother started shaking her fists at the tank (not the soldiers) and yelling to get those tanks off our street. “We are American citizens! How dare you turn tanks loose on us? Get off of my street you SOBs!” Dad started to fuss at her, she started to fuss at us kids to lay on the floor until the tanks passed. (We were SOOOOO in the window watching anyway! I wasn’t sure if I was supposed to be mad, scared, or proud, but I at least wanted to SEE what was going on.) We were getting the first taste of the sound of gunshots, something that would later become commonplace in my neighborhood. “After the riot, city officials created a special police task force called S.T.R.E.S.S. (Stop the Robberies, Enjoy Safe Streets). STRESS escalated the tensions between the police department and the city’s residents. 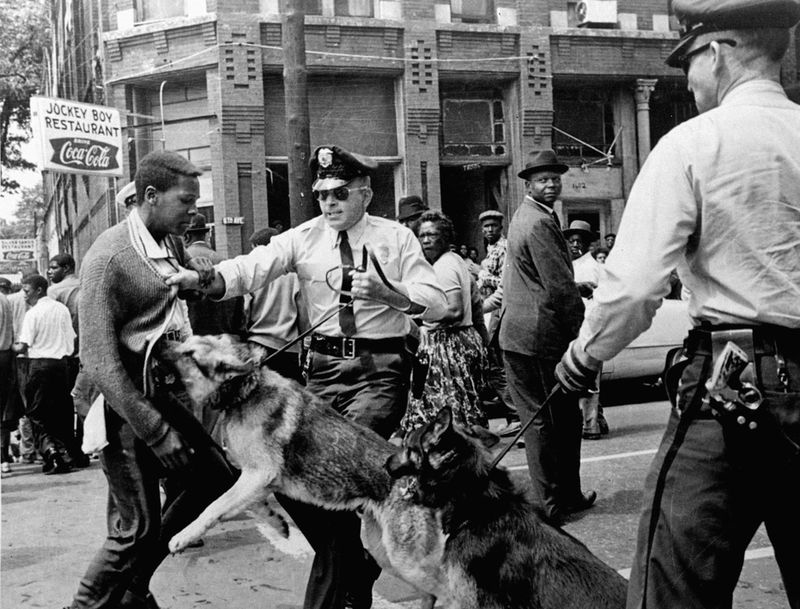 Civil rights leaders charged that STRESS was unjustly targeting African Americans. 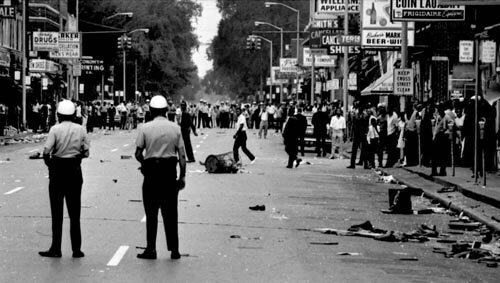 In 1974, Coleman Young, Detroit’s first African American mayor, disbanded the STRESS unit. Mayor Young later hired William Hart, Detroit’s first African American police chief. Under S.T.R.E.S.S. police could enter someone’s home without a warrant, arrest them without rushing to press charges, and to target anyone they wanted to at their own discretion to “keep the peace,” although they often harassed peaceful war protestors as well as minorities (especially the Black males). Police brutality became common We knew of people that were arrested and moved around from jail to jail so their family couldn’t find them for months. We knew of a man who had his door kicked down, got thrashed in front of his family, then taken away without pressing charges for months. They often stopped young guys and frisked them, roughed them up, made them lay on the ground until they just left…or arrested them for being in a group (3 or more) and being Black. Detroiters were very happy that Coleman A. Young was elected mayor, partially on the platform of eliminating S.T.R.E.S.S. He did a lot to help the city of Detroit and had a strong support from Detroit residents, when he became the first Black mayor of Detroit in 1973 until his death in 2001. My mother’s household supported the mayor, but not everyone in the extended family felt the same way. Holiday meals were charged with political arguments, but courtesy at meals remained among us. Yelling in disagreement and passing food and drink around politely at the same time was pretty usual. For a summer, in 1970, my big brother Ralph and I joined a protest group to take part in a global movement for peace and justice orchestrated by young people. We were 8 and 10 at the time. Youth Against War and Fascism protested the war, and “the heroic black uprisings inWatts, Newark, Detroit, Harlem" and women's liberation. During the Attica Prison riot the rioters requested a YAWF member, Tom Soto, to present their grievances for them. The WWP was most successful in organizing demonstrations in support of desegregation "busing" in the Boston schools in 1975. Nearly 30,000 people attended the Boston March Against Racism, which they had organized.” (Wikipedia) Although our mother consented to our request to join, by the end of the summer we were forced to leave because of its Socialist/Communist leanings. My mother was going through a divorce and she did not want our political protesting to be used adversely against her in her new single-parent role. We moved our efforts from the Vietnam War to work towards a pluralistic society with peaceful integration as an important part of preparing our nation for a more tolerant and just society. The first picket line I joined was at the grocery store chain “Great Scott,” for selling grapes during a migrant workers’ strike. We were given picket signs and we walked in a large circle singing protest songs, including “We shall overcome.” We were heckled by quite a few people who yelled at us for being “dirty hippies,” and suggesting we go home and take baths. I remember thinking it was an absurd thing to for someone to say to me because we were all clean. AND, I did not call myself a “hippie,” but rather, a “flower child.” Auntie Rain (Lorraine) used to draw flowers around our belly buttons, designating us flower children. “ We didn’t give away flowers, but we took the title because we considered ourselves to be children of peace, valuing life and “altruistic ideals of universal brotherhood associated with the flower powerpolitical movement. We never realized how unusual it was to be so involved in community work, politics, campaigning, picketing, letter writing, petition signing was amont other people our age because we met other activists with children and we all were the same…working for a better world. We taught each other. I still teach about peace, tolerance, love, justice and equality. The issues aren't gone, they've just changed their image. Why is the Trayvon Martin Case Even Important? Why's Snowden Just Another Flash in the Pan?